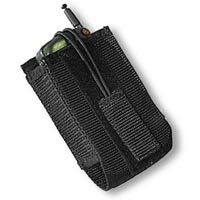 Walkie Or Cell Phone Belt Pouch By ACG. Simple design which holds most brands of walkies and larger cell phones. Features: Nylon web body, adjustable elastic strap, velcro closure. Dimensions: 5" L x 3" W x 2" D.